Spending a year studying at one of the School’s exchange universities had been my plan ever since I came to study in St Andrews. Leiden was a perfect choice for me because I had often been to the Netherlands and fallen in love with the country. The diverse modules at Leiden’s Classics department also gave me a fantastic excuse to finally learn Dutch. The academic year in Holland started a little earlier, so after spending seven weeks in the summer attempting to master this rather amusing language, I arrived on 1st September. I lived in a 19th century house with a garden and I had a view to a canal; quite a romantic setting after prison-like New Hall. Each day I cycled past canals, parks, and the typically beautiful Dutch houses on my way to the university (walking is not a thing here). 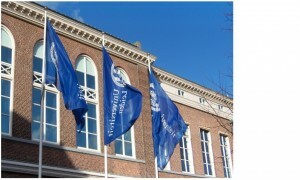 The most attractive feature of Leiden’s department must be the wide range of classes I could choose from. For hundreds of years, one specialty of Leiden has been the study of papyri (you have probably heard of Leiden conventions – yes, it’s the same Leiden). I got a chance to learn deciphering Greek handwritings from the Ptolemaic to the Byzantine era from original papyri in the university’s own collection. The most touching experience was to hold a 2000-year-old letter in my own hands, in which a brother sends his love to his sister. I don’t think I’ve ever felt closer to Antiquity. International students really feel welcome here. There is so much help: there are special academic workshops for international students, for example on the Dutch study system. There are loads of extra-curriculars in English, organised by the international society. I joined a group called ‘Contrast’ that brings together local and international students and organises fun events that involve a lot of tasty Dutch food and silly games. Leiden’s Classics department is a thoroughly lively place outside of the classroom, too. The departmental society ‘Sophia Aeterna’ organises regular events and publishes the department’s own magazine, to which students and staff contribute and subscribe. A committee recently released a film about the Classics degree, and we are currently rehearsing for the departmental play (singing in Dutch is my ultimate challenge)! Sophocles’ Elektra, performed by staff and students, will be staged in June. It took a while to settle in, but that’s what they call culture shock, of course. I am very glad I got the chance to study here. I learned things I wouldn’t have learnt elsewhere, like deciphering original papyri (even ones that haven’t been deciphered and published yet!). And – I know that sounds generic – but I’ve also learnt a lot about myself and what I want to do with my life. If you consider going abroad for a while, stop considering. Just do it!